3B Umpire Tom Woodring ejected Rays CF Mallex Smith (check swing strike three call) in the top of the 8th inning of the Rays-Nationals game. With none out and two on (R1, R2), Smith attempted to check his swing on a 0-2 changeup from Nationals pitcher Max Scherzer ruled a ball and adjudicated as a swinging strike on appeal by 3B Umpire Woodring. Play was reviewed and adjudicated by the UEFL Appeals Board (9-0-0), the call was correct. At the time of the ejection, the Nationals were leading, 4-2. The Nationals ultimately won the contest, 4-2. This is Tom Woodring (75)'s first ejection of 2018. Tom Woodring now has 6 points in the UEFL Standings (2 Prev + 2 AAA + 2 Correct Call = 6). Crew Chief Ted Barrett now has 11 points in Crew Division (10 Previous + 1 Correct Call = 1). 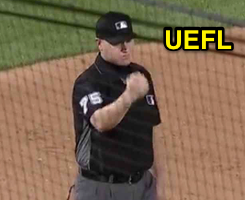 *This is the first ejection since May 28: E-051 - Mark Carlson (1; Clint Hurdle). This is the 52nd ejection report of the 2018 MLB regular season. This is the 25th player ejection of 2018. Prior to ejection, Smith was 0-3 (2 SO) in the contest. This is Tampa Bay's 1st ejection of 2018, T-3rd in the AL East (NYY 5; TOR 3; BAL, BOS, TB 1). This is Mallex Smith's first career MLB ejection. This is Tom Woodring's first ejection since March 16, 2017 (Yasiel Puig; QOC = U [Balls/Strikes]).